These findings have been described in the latest issue of Nature Nanotechnology by physicists at the University of Basel and at the EPF Lausanne. Nanowires are tiny filamentary crystals built-up molecule by molecule from a wide range of materials. Currently, these nanowires are being actively studied by researchers from all over the world because of their outstanding properties. Generally, the wires have a diameter of 100 nm and are only about as thick as one thousandth of a hair. This tiny dimension allows the wires to have an extremely large surface compared to their volume. This feature, together with their flawless crystal lattice and small mass make the wires attractive in a wide range of nanometer-scale sensing applications, including as sensors of chemical and biological samples, and as charge or pressure sensors. Recently, the team of Argovia Professor Martino Poggio from the Swiss Nanoscience Institute (SNI) and the Department of Physics at the University of Basel proved that nanowires are capable of being used as force sensors in atomic force microscopes. Nanowires, based on their unique mechanical properties, vibrate along two perpendicular axes at almost the same frequency. When combined into an AFM, the researchers will be able to measure changes taking place in the perpendicular vibrations caused by varied forces. These nanowires are used as small mechanical compasses that point out both the size and direction of the surrounding forces. The scientists from Basel demonstrated how they imaged a patterned sample surface with the help of a sensor. 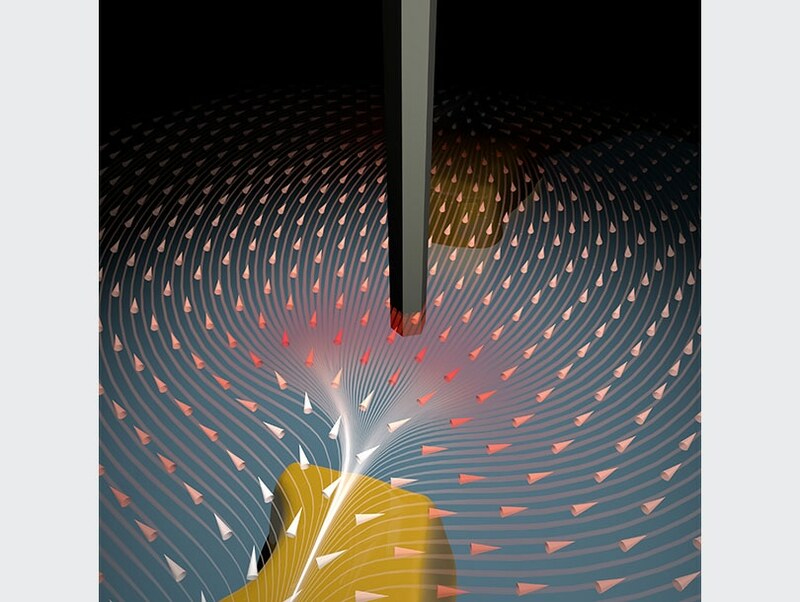 The scientists collaborated with colleagues from the EPF Lausanne who grew the nanowires, to map the two-dimensional force field above the surface of the sample using their nanowire “compass”. Test force fields developed by small electrodes were also mapped out as a proof-of-principle. The extremely challenging technical aspect of all the experiments was understanding an apparatus that has the potential to simultaneously scan a nanowire placed on a surface and also monitor the vibration of the nanowire along two perpendicular directions. The researchers used their study to demonstrate a new type of AFM that could further increase the application areas of the technique. The development of AFM that took place 30 years ago was honored with the conferment of the Kavli-Prize beginning of September this year. Professor Christoph Gerber of the SNI and Department of Physics at the University of Basel is one of the awardees, who considerably contributed to the extensive use of AFM in varied fields, such as medicine, biology, materials science, and solid-state physics. The different types of AFM are often carried out using cantilevers produced from crystalline Si as the mechanical sensor. Moving to much smaller nanowire sensors may now allow for even further improvements on an already amazingly successful technique. The research was supported by the National Center of Competence in Research for Quantum Science and Technology, the Swiss National Science Foundation, the Canton Aargau, the Swiss Nanoscience Institute, and the European Research Council Starting Grant NWScan.